The historic route used by the Canterbury settlers travelling between Lyttelton and Christchurch. Looking back over Christchurch from the Bridle Path. • By Matthew. 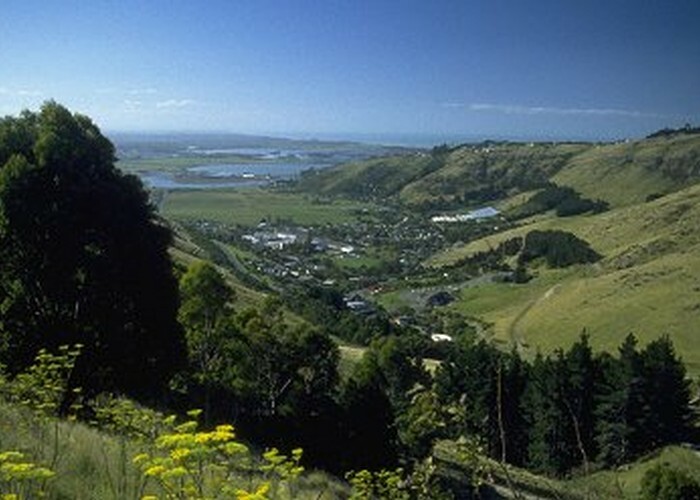 Until the Summit Road over Evans Pass was completed in 1857, the Bridle Path was the only route available to Canterbury settlers travelling from Lyttelton Harbour over the Port Hills. The path was constructed in 1850 by Captain J Thomas for the settlers due later in the year. It was a steep, rough track then, as it is today. Most walkers on the Bridle Path elect to do one side or the other. You can close the loop by taking the bus, or simply make a double crossing. You can drive or take the #28 Lyttelton/Rapaki bus to the Mount Cavendish Gondola Base Station. The Bridle Path car park is located next to the gondola car park. There are picnic tables here and a water fountain. The wide, gravelled track begins under eucalyptus trees, climbing easily past new rock fences installed after the 2011 earthquake. The raw damage to Castle Rock is visible up to the right, looking like a broken tooth. The track climbs past the first of a series of seats named after the First Four Ships of the Canterbury Settlement. The track climbs steeply past a block of pine forest then up past the sorry stump of the Wayside Cross. This cross was erected in 1856 by Mrs Godley to mark the site of a small spring. It was made by Mr Chaney who is now immortalised at "Chaney's Corner" on the road north of Christchurch. It was replaced due to vandals and natural wear-and-tear in 1864 and 1898. The 2011 earthquake was the end of it. Beyond here, the track zigzags past some eucalypts and climbs toward the summit, crossing both Summit Road and the Crater Rim Walkway. Over the road, the stone Memorial to Pioneer Women shelter is currently fenced off as an earthquake-damage hazard. The track drops past old concrete war bunkers, over some freshly broken rock, fallen from cliffs in 2011. Native scrub edges the track along here: mahoe, fuchsia, flax, poro poro, akeake, and the like. Eventually the Bridle Path becomes a sealed road, dropping past houses toward Cunningham Terrace. A footpath leads down to Simeon Quay, just west of the tunnel. From Lyttelton the #28 Lyttelton/Rapaki bus leads hourly back to the gondola terminus and to the city. Added 1 June 2001 by MatthewMatthew. 1 revision 21 October 2015 by MatthewMatthew. 514 views in the past year (43 per month).